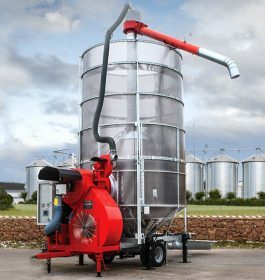 Pedrotti Master Driers are suitable for handling all types of materials and can deal with different climate conditions and cropping systems worldwide. With 15 basic capacities and with specific alternatives to meet individual requirements, the Pedrotti Master Drier is suitable for most applications. All new machines carry a 3 year factory warranty. The exceptionally high standard of construction of Pedrotti Master Driers makes them durable giving a strong demand for second hand machines. 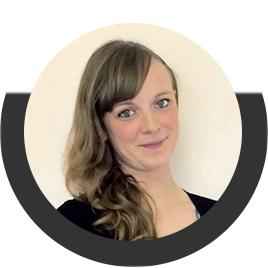 Find out about our Master Care Package. The Pedrotti Master Drier is constructed with a heavy duty chassis fitted with stabilising screw jacks and incorporating level bubbles. The drying chamber is fabricated from “Inox” perforated stainless steel and is framed for strength. 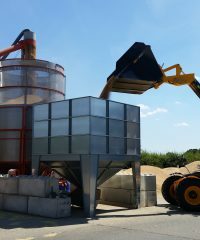 Internal rotating agitators ensure continual grain recirculation giving facility for fast unloading. The centre auger is driven by short belts incorporating a gearbox giving a more positive drive. 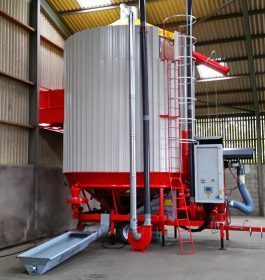 On all RS models the top auger is raised and lowered by a geared winch unit which engages with the centre auger drive and is automatically securely fastened in one operation. The same principle applies to the top screen. The centrifugal fan is quiet in operation and gives maximum possible air circulation throughout the drying chamber. The fan disengagement is very simple. A fan cover is provided on tractor drive models and an on/off switch for electric drive machines, this gives total control of air movement, especially during the loading/unloading process. The burner system incorporates a fail safe control system with photo cell cut off. Oil fired burners have a twin or triple jet oscillating principle controlled by independent solenoids with the possibility to interchange jets to meet any heat requirement. These dual fuel burners can be operated with diesel or kerosene and are economical, estimated at 5 litres per ton, giving 5% moisture extraction. 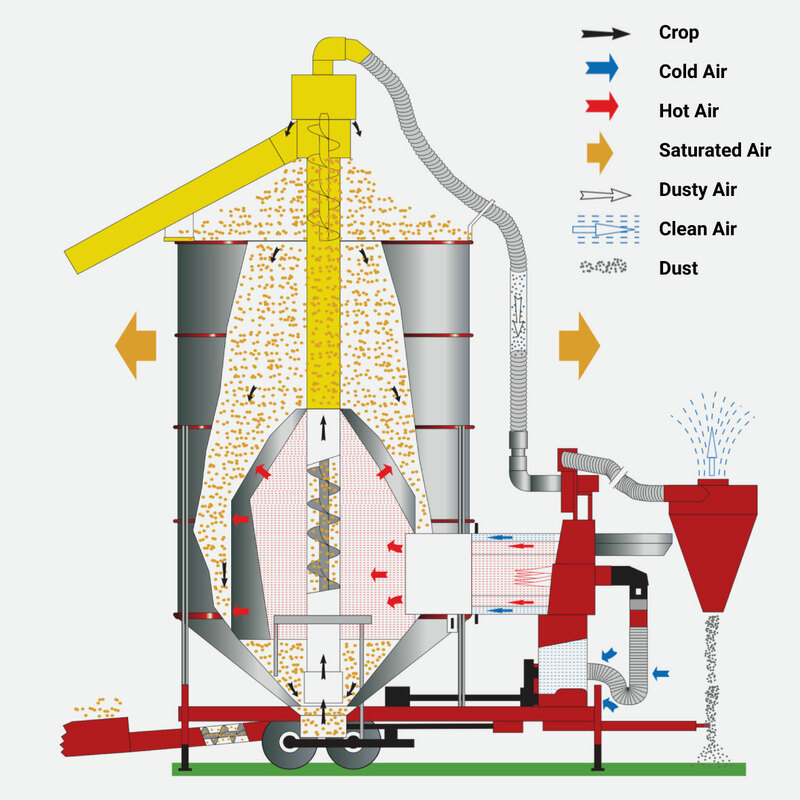 The automatic temperature system is directly related to moisture and is controlled by three pre-set thermostats which are individually programmed to meet crop requirements and have automatic cut-off facilities for control of heat. All controls are mounted in weatherproof panels, incorporating operating and safety systems. and tablet controlled, available in 12” and 7” format. Choose how you want your machine to work, manually or fully automated. Silver pages are in Manual Mode, the Copper ones are in Automatic mode. In every moment you know how your dryer is working. 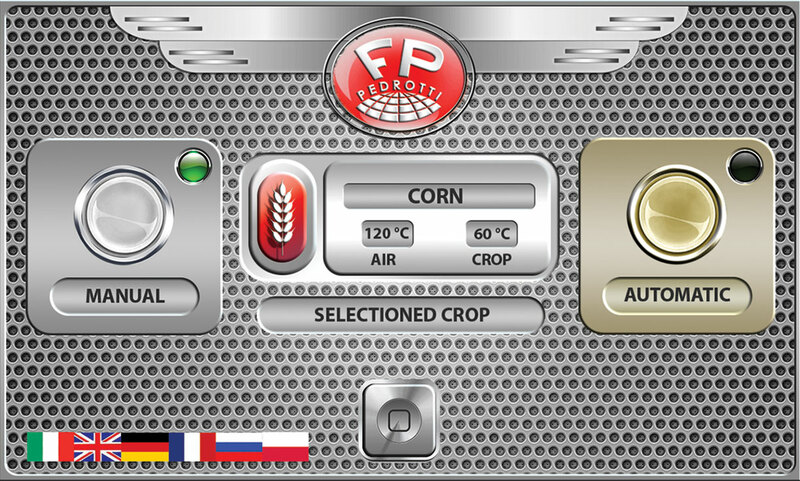 Choose your crop and adjust its parameters. Choose your language in the flags section and start working. 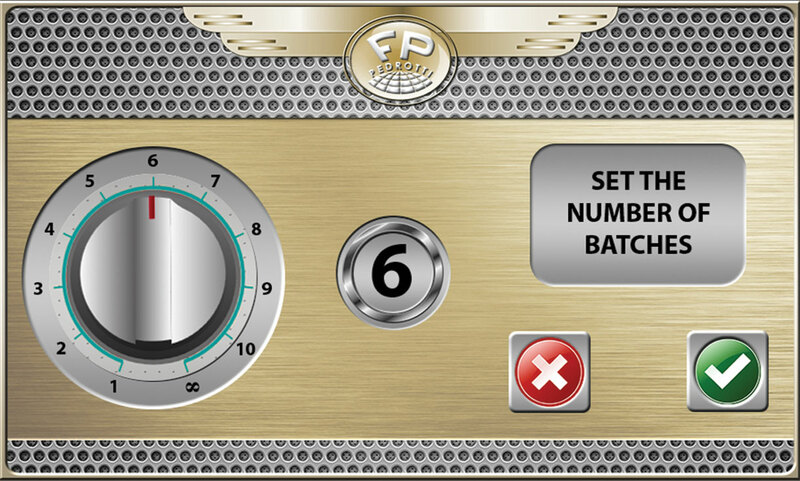 With the Pedrotti advanced touch screen the usage of the dryer becomes extremely intuitive and user-friendly. You can set the dryer from one to infinite batches, depending on your needs. 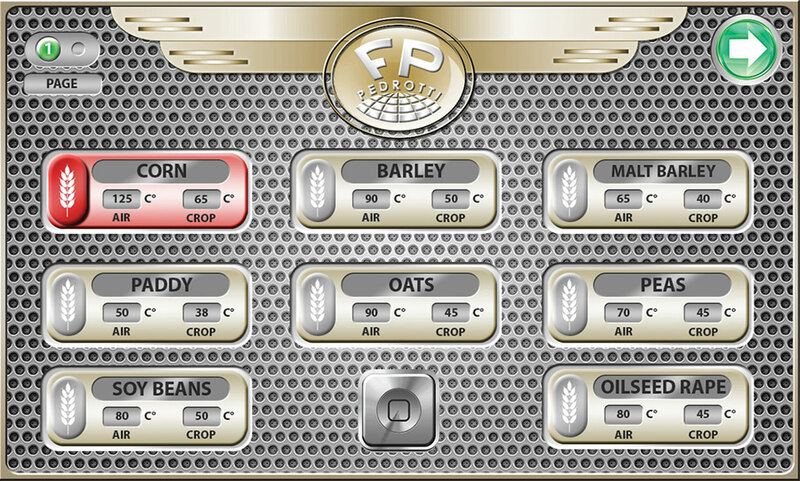 The automatic mode loads the crop, dries it, cools it and unloads the dried crop where you decide: on a lorry, through unloading augers to your storage. 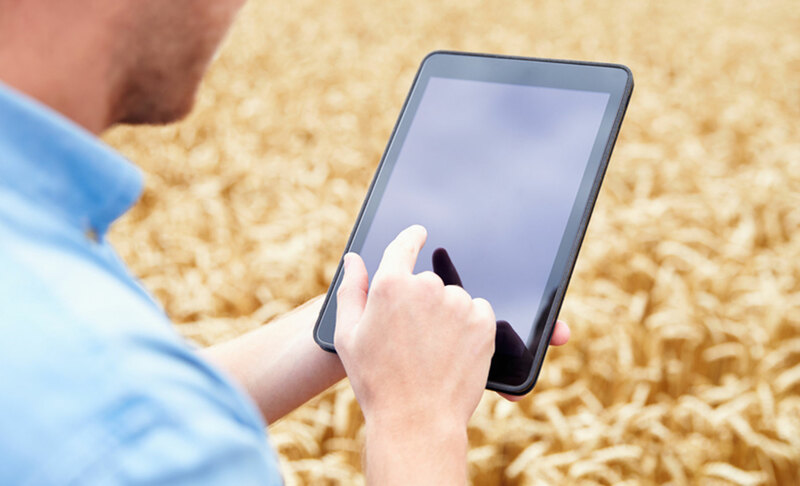 Choose from a two pages list your crop and settings. The Touch screen will record your own settings after you have turned it off. Choose which messages you want to receive and where you want them. Every message can be sent up to four different phones with an SMS or up to four different email addresses. The Everyware protocol allows an easy and immediate communication between you and your dryer. Everytime, everywhere you are. All the components and all the operating parameters of the dryer are constantly under control in one single page. 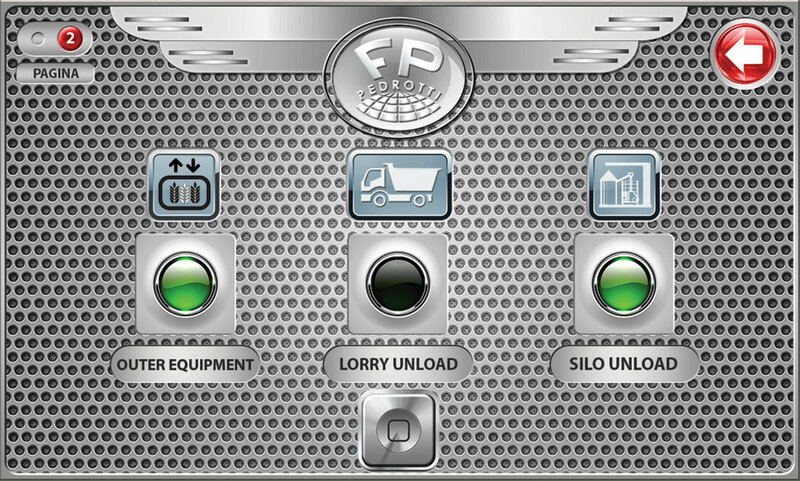 The manual mode allows you to control each process, even your cooling silo or the handling into your store facilities. 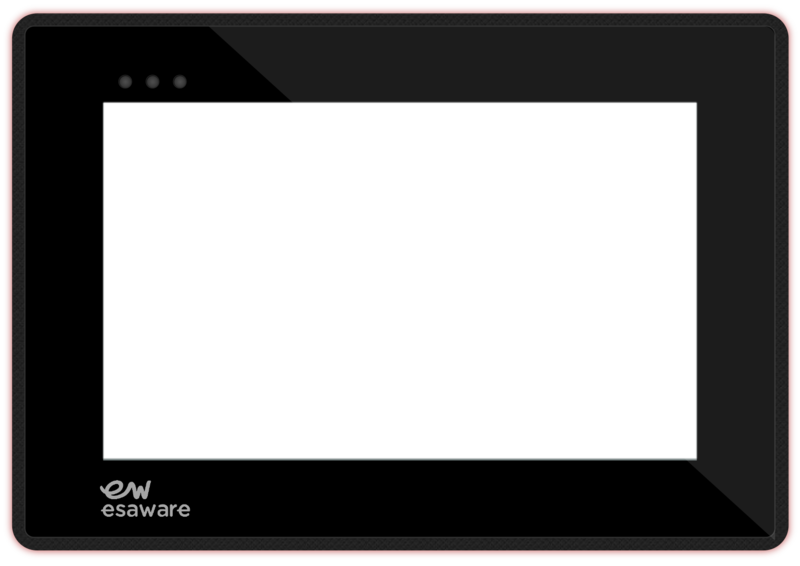 With Crew, the Esaware downloadable free App, you can check the status of every dryer parts and change your settings in real time. Just connect your machine to the web and check it from your house, field, or holiday. Furthermore our technicians can operate on your dryer in remote intervention or even in remote data backup. All Pedrotti Master Driers are now fitted with dual or triple stage fuel burners, manufactured ‘in-house’, with no ‘third party’ involvement which ensures that the parts are always readily available. 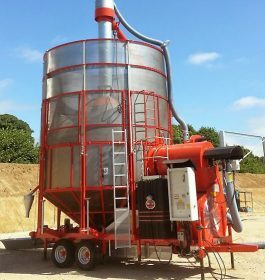 Both twin and triple jet-oscillating flame systems are suitable for operation with dual fuels (diesel/kerosene) and incorporate burner ‘fail safe’ technology. 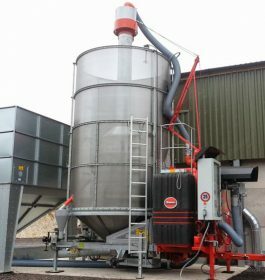 The unique Pedrotti Master DLC system is a simple way to ensure a continuous monitoring of all mechanical components driving the centre auger and the inside agitator arms. 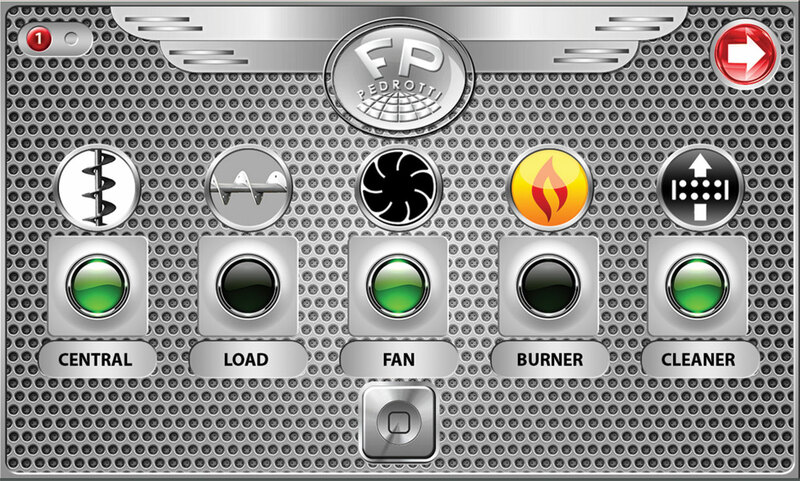 In case of failure the system ensures the automatic and quick shut down of the burner. The Pedrotti manufacturing process is of the highest order, using only brand names for all components.